Depending on their period of operation, certain nuclear facilities (or some of their components) contain highly active or contaminated materials that require new methodologies in order for them to be decommissioned and dismantled. This characterisation phase is becoming increasingly important, in particular in constrained environments. A number of measurement systems exist and new developments are in progress, however, not all of them have the same maturity. Lack of reference materials for performance assessment and lack of standards. 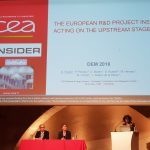 INSIDER will develop and validate an improved integrated characterisation methodology based on new statistical processing and modelling, coupled with present (and adapted) analytical and measurement methods, while taking into account sustainability and economic considerations. The project aims at improving the management of contaminated materials by proposing a methodology that allows to define and select the best D&D and remediation scenarios, and which produce well-characterised waste for which storage and disposal routes are clearly identified. 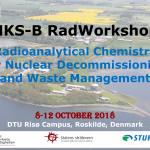 In particular, this methodology will help to acquire characterisation data in a Medium and High radioactivity (MA/HA) environment, which are the basis for D&D scenario studies compliant with regulations in European countries. This will give access to a reliable vision of the radiological state of a facility (and/or its components) at a relevant confident level, allowing the identification of the different D&D scenario options. INSIDER will then organise a common validation in the entire D&D process, based on three main use cases – nuclear R&D facility, nuclear power plant and post accidental land remediation. To reach its goal, the project has developed three main strategic objectives.